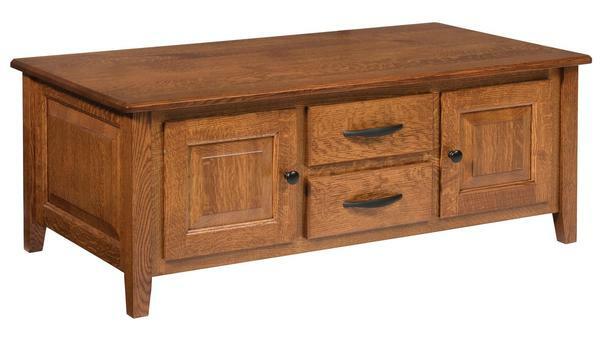 Our Amish Daintree Coffee Table with Drawers is built to withstand the test of time, thanks to its contemporary Shaker-style design and heirloom quality construction. This enclosed rectangular occasional table will never go out of style with defined clean lines. A solid top, two drawers, and two doors also offer enclosed storage for the living room or office, helping to keep those spaces tidy and organized (or at least making them look that way). Raised door fronts and side panels and tapered feet add interest and character to this table that can be made in your choice of wood, finish, and hardware from a variety of options.